Back from adventures, and with a new, snappier format! This week, we talk writing tips, visit with Timothy P. Green, and dodge thunderstorms aboard Jacie Sails. As mentioned in the podcast, here’s the footage of Your Humble Narrator on 27 Aug 2015 using a handheld GPS (with no charts on it, just latitude and longitude) and paper charts to navigate 10 miles of shallow water north of Marathon, FL. In a rainstorm. That became a hailstorm. Depth finder not operating. You get the picture. A snappy (did I already use that word three times?) 15-minute podcast hosted by four very articulate and enjoyable writers. One of my top picks for traveling. Their 15-minute format is a major inspiration for our new shorter format. If you’re a regular listener, you probably know what I’m up to. But if you haven’t checked these out, I hope you will! I’ve put a lot of sweat, and occasionally blood and tears, into these projects. Heck, I even quit my day job…so please, please help a brotha out and check these out. And share them with your friends. I need the implants. If you haven’t checked out the new record I produced for Timothy P. Green, I urge (beg? cajole?) you to go immediately and download the FREE single Birds Had Flown. I promise you will almost certainly dig it. Even if you’re a fan of death metal, rap, or Balinese gamelan music. I’ve been told it’s quite funky, and you can’t go wrong with multiplatinum engineer Thom “TK” Kidd and a cast of GRAMMY® winners, a real live horn section…oh, my! This is the first book by my dad, who at age 86 has been blogging since around 2009. I’m proud to provide the technological and editorial help, and to get his stories into book format. We have just released Depression Baby as a hardcover. Now you have three choices: Kindle, hardcover, and signed Limited First Edition hardcover. You can get any of the three formats by going to www.DepressionBaby.com. This book is not about being depressed, by the way. It’s about growing up in the mountains of Western North Carolina during the Great Depression. If you enjoy reading about times when people got along better together and lived in closer harmony and Zen with the land, this book’s for you. Our Mainsail ripped during a squall off Marco Island, so while I was recuperating in Marathon, I took it (on a bus…that’s a whole ‘nother adventure) up to Key Largo, where Kim did a great job repairing the damage and making some proactive fixes as well. 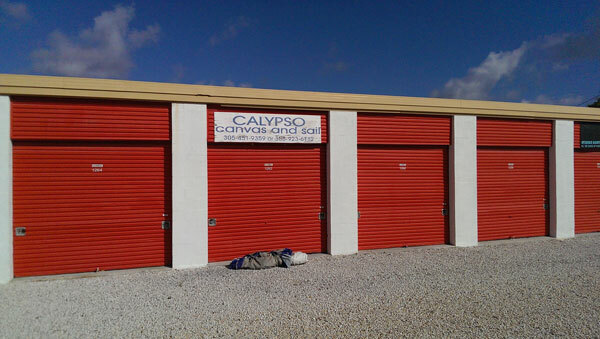 I believe they are about the only shop between Key West and Miami to have a proper zigzag-stitching machine for sails. (You do NOT want straight stitching on your sail repairs.) Great folks, quick, and their work is excellent. I’m putting Steve second here, as I suspect he’s old school and less likely to be on the internet; but he helped us out in a huge way! 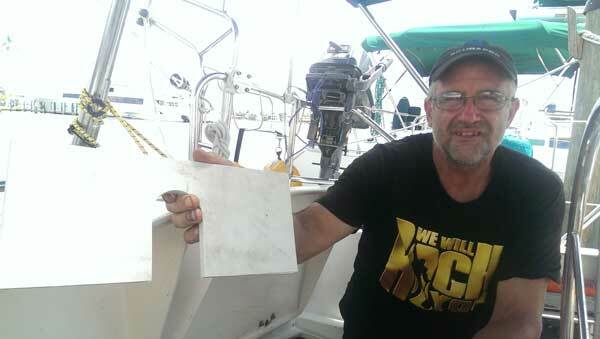 Steve not only fixed the cutlass bearing that was supposed to be fixed by the haulout in Gulfport; but he also fixed out rudder table, which was insanely loose. By rudder table, I don’t mean something optional that you eat cheese and crackers on. I mean the thing that holds the top part of the rudder post stable. Which is kind of an important thing. Steve fabricated a reinforcing collar out of stout star board (above) that should keep us in good shape for a while.